Once you register your team, SportsTG will send you a confirmation email with a link and a team code. You and your players then need this link and team code to register as individuals to the team. All players including yourself must do this to be covered by medical insurance . 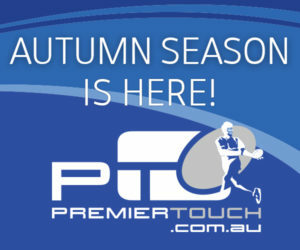 Nominate your team before March 22 and receive a free Steeden touch football, delivered to your venue in Round 1! New online system which ALL players must register in – no more insurance sheets at the venues! More training for our Venue Organisers and Referees plus venue organiser shirts.